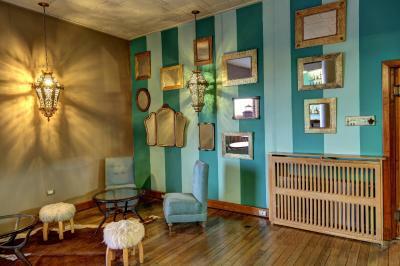 Lock in a great price for Hotel Tres Reyes – rated 8.6 by recent guests! 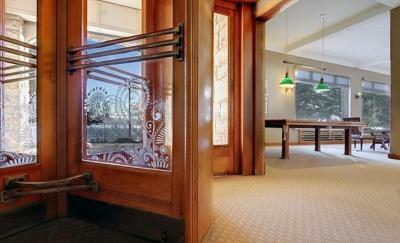 This hotel has the sense of an old-timey lodge with beautiful common rooms. The lounge looks out over the lake as does the bar. The staff is very friendly and helpful and I wished we had stayed there longer. First the good stuff. 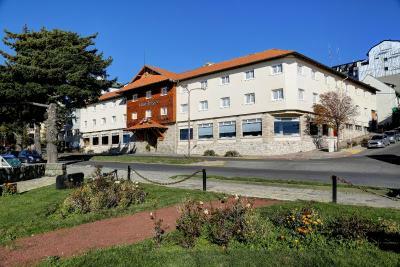 It is a beautiful old hotel. Not fancy, but fitting for a mountain hotel. It was clean. Breakfast included — eggs, several different breads, fruit, etc. Generally very sweet but that is typical for Argentina. The location is fantastic. Great view of the lake. Lots of shops and restaurants close by. Very nice sitting area whee we played cards in the evening and enjoyed drinks in the afternoon. Now the less good. WiFi is terribly slow. There is no AC. Weather was very nice when we were here so not a problem at all, but it might be an issue in peak summer. We visited in early March (almost fall here) and it was quite nice. I’d stay again at this time of year — no question.. Fantastic location, on the lake and close to everything. Great value. Nice staff. Good breakfast. Very conveniently located on the waterfront near the centre of town. Nice breakfast and good rooms. Very good location. Great view from the breakfast dining room. Room size is decent. Great location with a beautiful view. Staff was very helpful and patient with my poor Spanish. 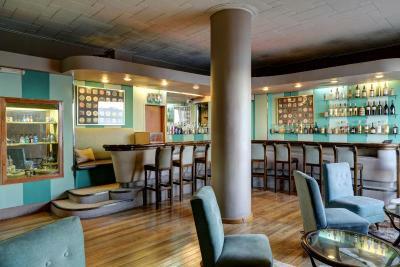 Bar was very nice, a great spot to get the evening started before heading out on the town. Lots of great outdoor activities close by. Room was very clean and comfortable. Most staff were great and the breakfast and location were excellent. Hotel was fine, excellent location. Breakfast almost superb. Hotel Tres Reyes This rating is a reflection of how the property compares to the industry standard when it comes to price, facilities and services available. It's based on a self-evaluation by the property. Use this rating to help choose your stay! 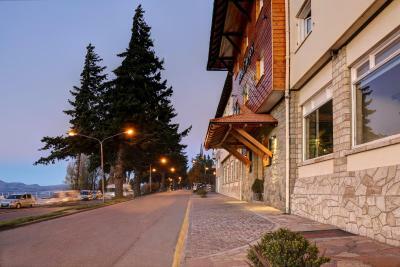 One of our top picks in San Carlos de Bariloche.Hotel Tres Reyes is set in San Carlos de Bariloche, 650 feet from Civic Center. With free Wi-Fi, this 3-star hotel offers a 24-hour reception. The property is 7.5 mi from the ski area and San Carlos de Bariloche Airport is 7.5 mi from the property. Hotel Tres Reyes offers some rooms with views of the lake and other rooms overlooking the Garden, all rooms have private bathrooms, and include a security box. The hotel rooms are equipped with a flat-screen TV. 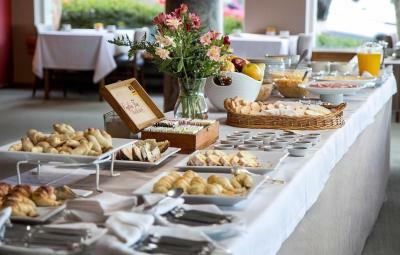 A buffet breakfast is available every morning at the accommodations. 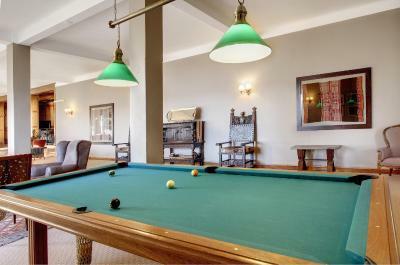 The Hotel has a bar and a pool table. When would you like to stay at Hotel Tres Reyes? 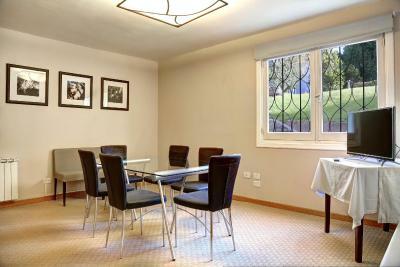 A comfortable room featuring garden or street views, a 32" LCD TV, a mini-bar and a safe. The private bathroom is completed with a hairdryer and a shower. 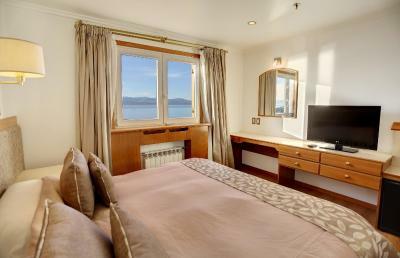 A comfortable room featuring Nahuel Huapi lake views, 32" LCD TV, a mini-bar, a safety deposit box, and a private bathroom with a shower. 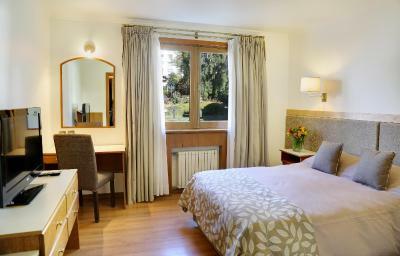 A comfortable room featuring views of the garden or street. It is equipped with a 32" flat-screen TV, a mini-bar, a safety deposit box and a private bathroom completed a shower and a hairdryer. It is fitted with 2 single beds. 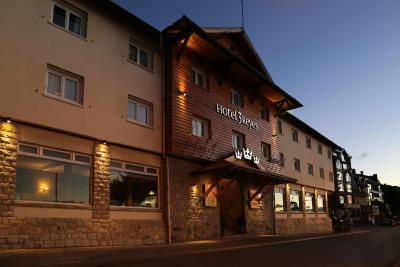 Tres Reyes Hotel is located right in the center of Bariloche, just one block from the main street and some steps from the Civic Center. 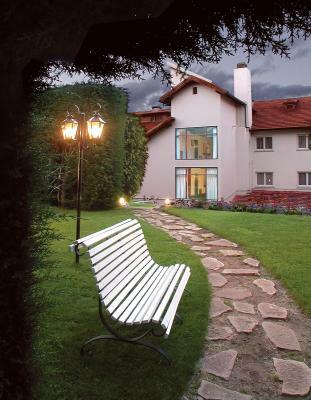 Featuring a classical Patagonian style in the outside but being fully- renovated inside, it blends top-quality furniture, carefully-chosen decoration, unrivalled views of Lake Nahuel Huapi and beautiful gardens with lush vegetation. 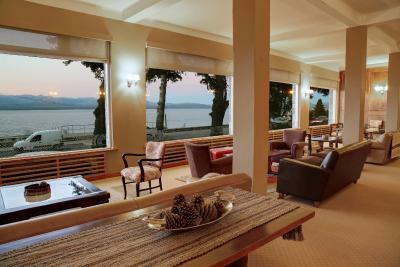 The spacious living-room with its stunning view to Lake Nahuel Huapi and the Andes Range will let you relax, enjoy your stay at the Hotel and appreciate the beauty of the landscape. It is open all year round. 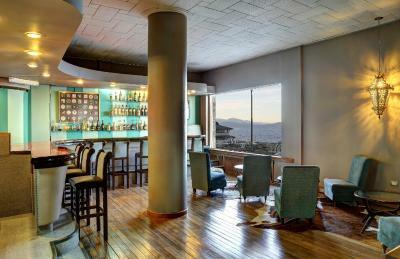 House Rules Hotel Tres Reyes takes special requests – add in the next step! Hotel Tres Reyes accepts these cards and reserves the right to temporarily hold an amount prior to arrival. Please note that smoking is not allowed on the premises. If smoking occurs, an additional fee will be charged upon check-out. Note that parking is subject to availability at check in time. In case there were not availability, Front desk Employees would inform about other parking available (with cost). Guests will be required to send a valid ID number to the property. Cons: Wi-Fi is painfully slow. It is slow in most of Bariloche [just be forewarned]. Room was a bit dated. Could use more electrical outlets, especially near the bed. Breakfast was not great. They have an absurd key policy – only one per room even if two people are staying there. Very inconvenient if people have different plans. 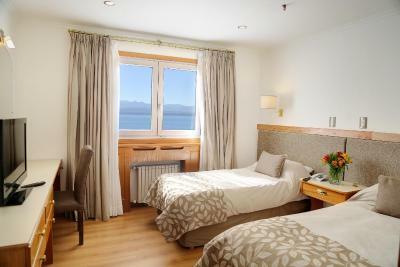 Rooms [with great view of lake] was relatively quiet in spite of being on a busy street. Bed was comfortable. Free parking on a first come, first serve basis. Bathroom water pressure and hot water were good. Common areas are comfy for hanging out if there is bad weather. Very close to restaurants and shops. Rooms are basic/old so don't expect much but it was enough for us that only stayed in the room when taking a shower and sleeping. Also some of the hotel could use renovation, with a little work it could be a really nice hotel..
Good location, close to the center of the city while still having great lake views from the dining room and lobby. Breakfast was nice with fresh ingredients but we had better and richer in other places also in south of Argentina. There is free parking for the guests right in the back which was very comfortable as we rented a car.. The restaurant did not serve evening meals and the hotel would not accept US Dollars, although everywhere else in the town would. The location on the lake front, but also very close to the town centre. We booked this hotel for a good price. When we arrived we saw the prices you normally have to pay, and thought this was way out of proportion! The staff was wearing a tie, so from that point you could see it was a higher standard hotel, but that was it. Rooms are old, in the shower (in bath) you have a curtain (I hate that), etc. If you pay really that price, I would expect a lot more (pool, more modern rooms, etc.). The breakfast was really nice. 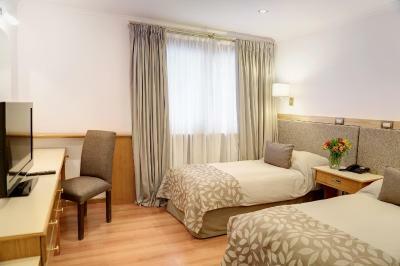 Also the room was clean (although it was really weird that a staff member was checking up on the cleaniness of the room that her cleaning staff just cleaned, after we already checked in and our stuff was there). We liked also the bed and pillows, we slept very good. Hotel was a little tired but was expected from the photos. If you want a quiet room take one facing the back. We had a great view of the lake from the window but noise from the traffic below. We only stayed one night but enjoyed everything about the hotel. Parking facility very convenient. Right at the center of the action and facing the lake. Room was very hot with poor ventilation. Great views and excellent location. 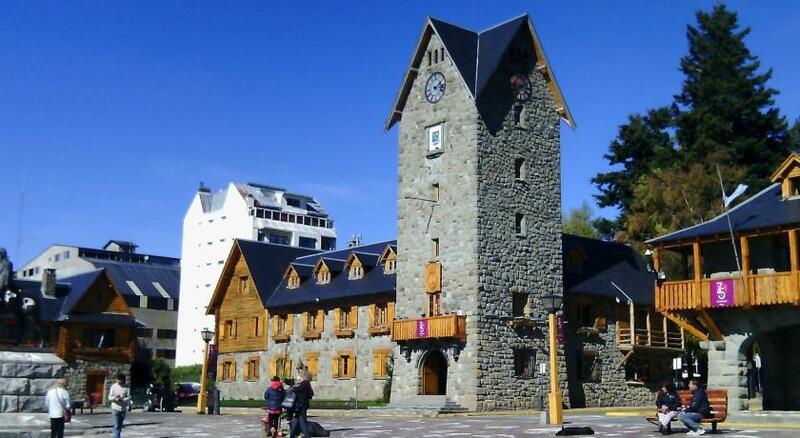 If one wants to explore Bariloche, this is the place to book and stay. Located in the Very center of it , easy access to anything you need ! This is probably the worst hotel I've ever encountered. On paper it sounds great. Free parking is offerred, but you're not told that the free parking is in a parking lot a twenty minute walk away. The voucher for the "welcoming cocktail" at the bar is only good for just a few items that include orange juice and a cheap wine but no tonic. But the above are trivial matters compared to the condition of the room. When we walked in the room was drenched by a perfumed spray. We opened the windows and went to dinner. When we came back it became obvious what they were trying to hide: the room had a terrible stench, overpowering and all encompassing. Completely unacceptable and an obvious fraudulent coverup of a serious problem with a perfume spray. When we complained to the front desk the man came up, agreed the smell was horrible and offerred us the same spray. An offer we refused. The room was full of mould, the ceiling looked like someone had painted mould over. We were offered another room, right next to the elevator on the first floor. Talk about a devil and the deep blue sea. The general condition of the hotel is tatty. The floorboards in the corridors sink under your feet as you walk. The carpeting is faded and tired. This is a hotel that needs to be shutdown and the building condemned. Stay here at your own peril.